the talented founder/designer of FOVE. We are happy to introduce this unique new brand, handmade by Anna Bianco: FOVE, Nouveau Traditionnel. FOVE is specialised in woven textile design. All fabrics are produced in France with a specific French technique and mixes it with modern and graphic designs. For this collection, Anna found inspiration in modern art and minimalist paintings, as we can see on her elaborated woven prints. FOVE creates unique art pieces to decorate our homes. We had the pleasure to meet Anna Bianco, the brand’s founder/designer, and asked her a few questions to share with you! Credit: Anna Bianco, Official Picture. First of all, congratulations for this amazing new brand. We love it! Now, could you tell us more about yourself? Well, I’m a French designer based in Biarritz. I’ve studied Art and Fashion Design at HEAD in Geneva. I’ve travelled and worked in the fashion field around the world for 6 years, and now I’m finally back in France. During this time I’ve worked for huge companies based in Indonesia and North America. It was an amazing experience, but also where I discovered the other side of fashion, of globalisation and massive consumption. With collections changing every month, the target was fast fashion, so we had to abandon creativity and design quality in order to make the cheapest products again and again. That’s why I decided to go back to France and start my own project, based on quality textiles and French know-how: a slow design project. And could you tell us more about FOVE? Fove is a textile design brand. The fabric itself is the most essential part of our work. 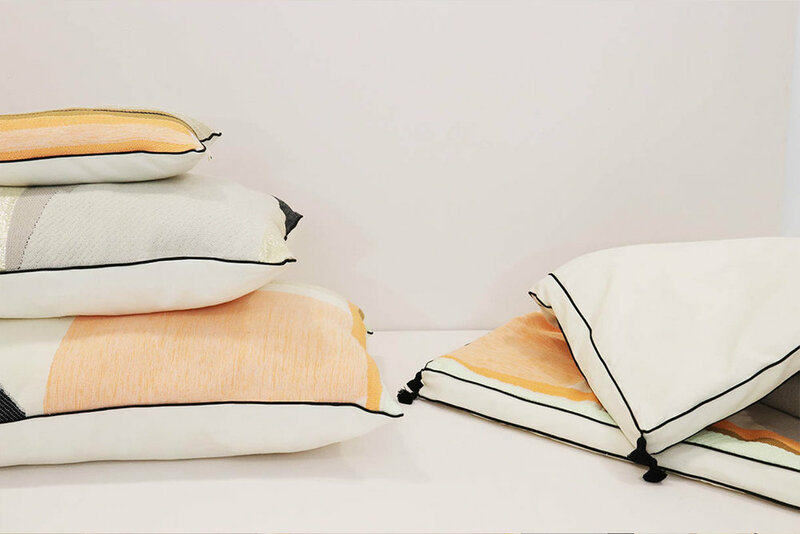 First I develop the textile and after the finished products, like cushions, blankets and lamps. This is a really new project, born in a meeting between me and Helene Biasiolo, a fashion and interior designer. She opened my eyes to interior design and I saw all its creative and economic advantages. In the future I would love to focus on and propose fabrics and textile design to other companies. Fove’s concept is based on the encounter between tradition and modernity, hence our slogan “new traditional”. I like playing with the textures, lines and colors, like a painting. Also, I was inspired by the Fauvism (back to the color) to create the brand’s name. What was the biggest challenge during the creation of your new brand? Finding seamstresses at a good prices in France. People don’t want to work on complicated products. That’s a real pity because once again we loose a precious knowledge. After a year I’m still looking for it and I sew 70% of the production myself. What do you wish for Fove? I wish to have the chance to bring out every project I have for the studio. I want to keep challenging archetypes, tell more stories and help people have a better experience in life, out of conventions. Any new projects coming soon? Of course! I’m working on the next collection of Fove and I have a beautiful proposal to expose my work and create a series of woven artboards for an exhibition in Biarritz. Hahaha. I would love to say that every morning I practice yoga and drink some fresh healthy juice, but the reality is that I just wake up fast, get changed, dress my little boy, run, run, run, and finally drink a cup of coffee. That’s all, that’s my reality. And finally, what is your favorite city in the world? If you enjoyed this article, you should check our story on Mapoésie.